Sephora Favorites For Holiday 2015 | Top Beauty Blog in the Philippines covering Makeup Reviews, Swatches, Skincare and More! SEPHORA FAVORITES GIVE ME MORE LIP $59.00 ($197.00 value) - This covetable multibranded mega lip set with features lip colors in bold shades that range from berries to red and soft nudes and mauves. Get the ultimate texture with a full-size, Ciate Liquid Velvet in Risque or a full-size of Smashbox’s Be Legendary in Matte in Magenta Matte. Nourish lips with the deluxe size of the Fresh Sugar Tulip Tinted Lip Treatment and get alluring lips with the deluxe-size, Too Faced Melted Liquified Long Wear Lipstick in Berry. From clear to bold hues, this lip kit is perfect for gifting or adding to your beauty wardrobe. SEPHORA FAVORITES LASHTASH $45.00 ($127.00 value) - Stretch, volumize, and enhance lashes with this wardrobe of eight deluxe mascaras, featuring wands that curl, lift, and define. This eleven piece set comes with an array of eight mascaras and a curler, lash fibers, and a precision lash liner for the ultimate lash looks. SEPHORA FAVORITES EXTEND YOUR STYLE $32.00 ($78.00 value) - Eliminate the lingering scents of last night with Alterna's Bamboo Cleanse Translucent Dry Shampoo in Mango Coconut. Amika's Perk Up dry shampoo is best for keeping damaged hair clean between shampoos with their feather-light, scented formula of sea buckthron berry extract. Bumble and Bumble's Pret-a-Powder delivers three essential benefits — dry shampoo, style extender, and volumizer — in one bottle, for an effortlessly tousled look. The rice powder in Drybar's Detox dry shampoo instantly soaks up oil and amps up fullness to keep your blowout looking polished, prolonging your good hair days into good hair nights. Highly absorbent micronized oat milk powders in Klorane's dry shampoo are undetectable even on brunettes. Keep Living Proof's PHD dry shampoo in your gym bag to neutralize oil, sweat, and odor anytime. Lastly, 24K Sally Hershberger's mineral-infused dry shampoo adds texture and lifts hair to unparalleled, ultra-voluminous heights. SEPHORA FAVORITES SUPERSTARS $75.00 ($207.00 value) - The ultimate beauty haul, this must-have set includes some of our best mascaras, eyeliners, eyeshadows, highlighters, and a primer, along with the latest favorites. It’s the perfect gift for any beauty conneosior, or treat yourself to this set for everything you need to highlight features, let eyes stand out, and create basic to sultry makeup looks. SEPHORA FAVORITES LIQUID LUXURIES PERFUME SAMPLER $65.00 ($110.00 value) - Inside this box, you’ll find 15 samples of some of our most sought-after women’s perfumes. Choose your favorite, and then take the included scent certificate to any US Sephora store* to redeem for a full-size bottle of your favorite featured fragrance at no extra cost. 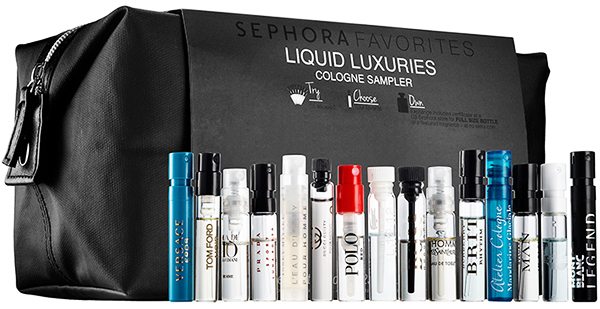 SEPHORA FAVORITES LIQUID LUXURIES COLOGNE SAMPLER $65.00 ($113.00 value) - Inside this box, you’ll find 15 samples of some of our most sought-after men’s fragrances. Choose your favorite, and then take the included scent certificate to any US Sephora store* to redeem for a full-size bottle of your favorite featured fragrance at no extra cost. 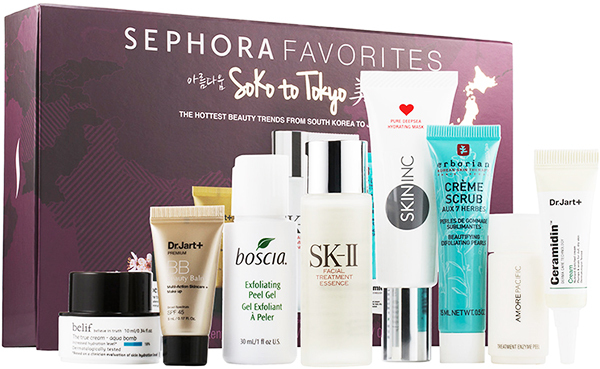 SEPHORA FAVORITES SOKO TOKYO $40.00 ($115.00 value) - This set includes eight products from all the hottest trends in Asian skincare, from Soko to Tokyo. Cleanse with Erborian's Crème Scrub, a gentle daily cleanser featuring a soothing complex of seven Korean herbs and micropearls for skin that appears visibly clearer, smoother, and more luminous. Exfoliate and brighten with Amore Pacific's Treatment Enzyme Peel, a highly effective, botanical-based brightening exfoliator made without harsh ingredients. Boost all your skincare steps with Boscia's Exfoliating Peel Gel, a lightweight peeling gel that delivers gentle exfoliation for deeper, more thorough cleansing results. Follow up with SK-II's cult-classic Facial Treatment Essence, a refreshing essence that moisturizes the skin and supports skin cell renewal. Skin Inc's Pure Deepsea Hydrating Mask is a unique sleep-in transparent gel mask that hydrates, clarifies, and brightens skin, all in a single step. Add weightless hydration with Belif's The True Cream Aqua Bomb, a gel-cream that 'floods' the skin with a rush of refreshing moisture, or Dr. Jart’s lightweight Ceramidin™ Cream, a time-release moisturizer that plumps the skin and hydrates the skin barrier from within. Top it all off with Dr. Jart's Premium Beauty Balm SPF 45, a one-step balm that perfects the appearance of skin while protecting it from the sun and environmental factors. Amazing products! I want them all! I love Sephora and Sephora products! Such a brilliant idea, will definitely be adding one or two of these on my christmas list! Lovely post, so many items. Adoro la sephora trovo sempre prodotti che nella mi città non troverei . Thanks for the review! I would like to try this, it sounds good!!!! Beautiful products, I love Sephora! Looks so amazing, I am eager to Sephora sales to buy it. Thanks for sharing dear. All of the sets are a great way to try new products with a minimum investment. great favorites dear...you look amazing! OMG this lip product set is so gorgeous. I would love to get them. I really love Sphora products. Have an amazing quality!